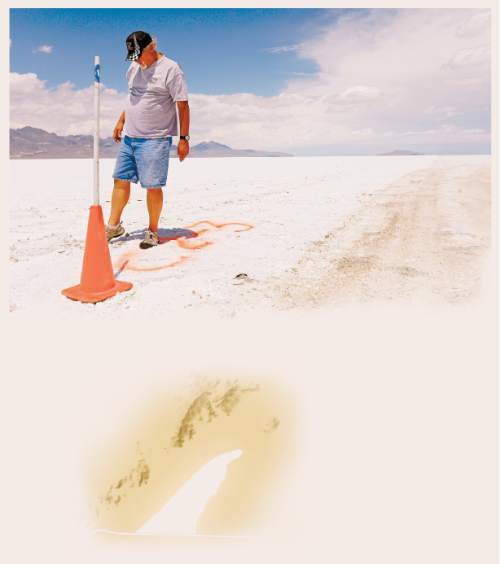 Trib Talk: Bonneville Salt Flats minus salt? Leah Hogsten | The Salt Lake Tribune There are four "courses" on the Bonneville Salt Flats used by the Utah Salt Flats Racing Association, but only the two longest--Course #1 or the "Short" course that is 3-5-miles and Course #2 or the "Long" Course that is 5-7-miles--are operational during Speed Week. Course #4 (shown) is the perfect example of how an operable racing track should look; strong, uniform and translucent with a "spider-webbing" pattern of pressure ridges said Dennis Sullivan, president of the Utah Salt Flats Racing Association, but Course #4 is too short for racing purposes, used only for rookie orientation and licensing. Levels of salt at the Bonneville Salt Flats are depleting rapidly. Many mineral extraction companies use salt from the flats, diverting the lake's natural water supply, affecting already record low lake water levels. All of these factors contribute to lack of salt on the salt flats that recharge naturally by regular flooding and ebb and flow of the salt water. Leah Hogsten | The Salt Lake Tribune "If we tried to run a race, we'd be looking for an accident," said Dennis Sullivan, president of the Utah Salt Flats Racing Association or USFRA. Sullivan kicks at the dangerously thin, popcorn-like salt on Course #2 that reveals unstable dirt below that is hazardous for driving upon at such high speeds. There are four "courses" on the Bonneville Salt Flats used by the Utah Salt Flats Racing Association, but only the two longest--Course #1 or the "Short" course that is 3-5-miles and Course #2 or the "Long" Course that is 5-7-miles--are operational during Speed Week. Levels of salt at the Bonneville Salt Flats are depleting rapidly. Many mineral extraction companies use salt from the flats, diverting the lake's natural water supply, affecting already record low lake water levels. 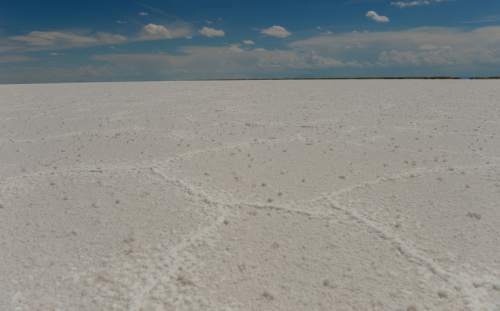 All of these factors contribute to lack of salt on the salt flats that recharge naturally by regular flooding and ebb and flow of the salt water. Why are the famed Bonneville Salt Flats shrinking? On Tuesday at 12:15 p.m., University of Utah geologist Brenda Bowen, Dennis Sullivan of the Utah Salt Flats Racing Association and Tribune reporter Emma Penrod join Jennifer Napier-Pearce to answer the question as well as describe the impacts of a disappearing natural wonder.